I just wanted to share some fun vintage magazine covers with you for Halloween. 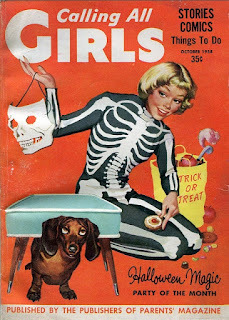 Calling All Girls was a retro magazine for girls. It eventually became YM magazine. It was before my Momma's time, but we both love finding images from the magazine. The reason? 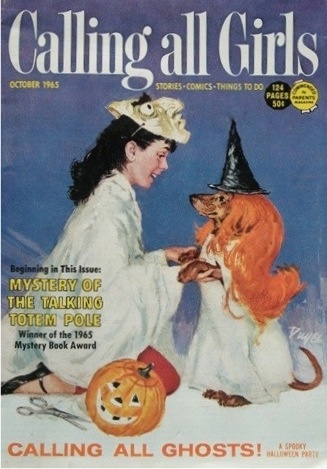 There was usually a dachshund on the cover! We found some great retro images to share with you here. The picture above shows a girl dressed as a skeleton with her dachshund, from 1958. 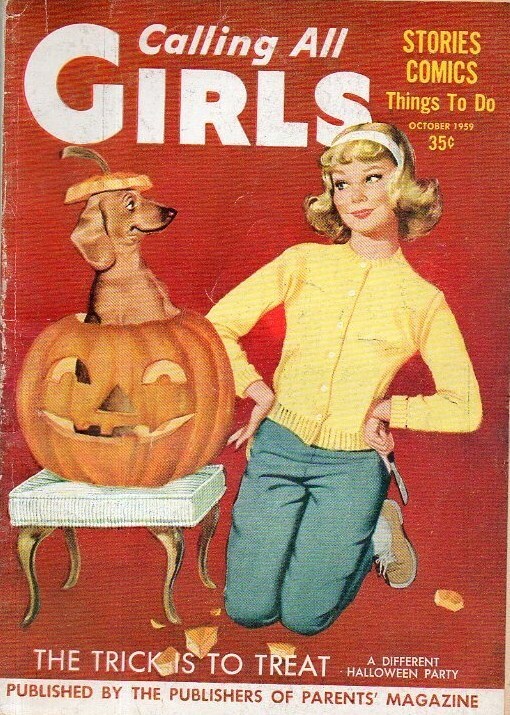 Below, from 1959, a girl decorates a Jack O' Lantern with the help of her cute dachshund. 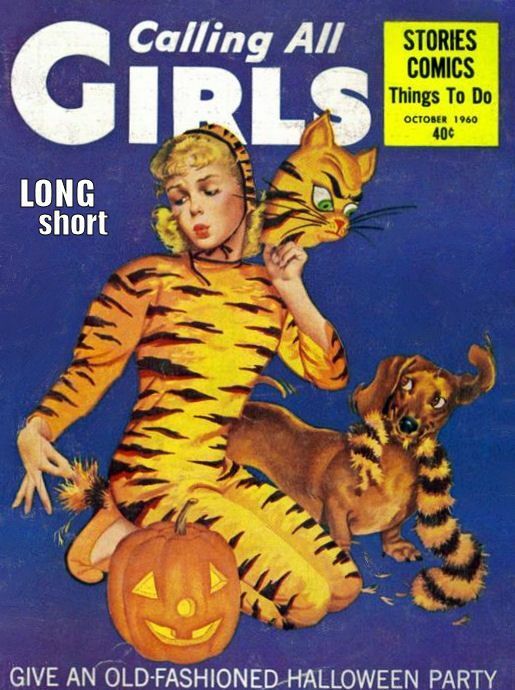 On this 1960 cover, a dachshund helps her person dress up as a tiger. Now I like this! 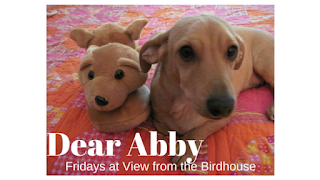 The dachshund gets into dress up fun with a Halloween costume here. This cover is from 1965. A little dachshund helps bob for apples on this Halloween cover. 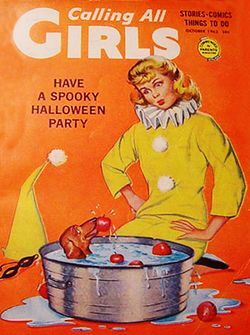 I hope you've enjoyed this Halloween fun! I'd love to hear from you in the comments below. I'm looking for fun questions and topics for future Dear Abby posts. I love seeing vintage designs! Thanks for sharing. Something I find extremely interesting from past years is the originality they show in their products, publicity, etcetera, etcetera. One example are these amazing covers. I love it. Thanks for the visits! I am a big fan of vintage illustration -- it is so much fun! Great job Abby!!! I LOVE those vintage covers...just shows there was just so much more innocence and fun during those times. Kim, thanks for stopping by! I like the innocence and fun of these retro illustrations, too. Those magazine covers are terrific! Clearly someone at that publication was a true dachshund lover :). I have never heard of the magazine before, but I always appreciate seeing vintage dachshund artwork. LOVE it! Thanks, Barbara! I bet you are right about someone at the magazine being a dachshund person. Had to be!